Here is an outdoor scene integrating a villa inspired by the Type Variant house (Vincent James Associates Architects) which is another project I started some times ago and that I hope to finish one day. The goal wasn’t to achieve a photoreal result but something with a more painting feeling, at least for some images. 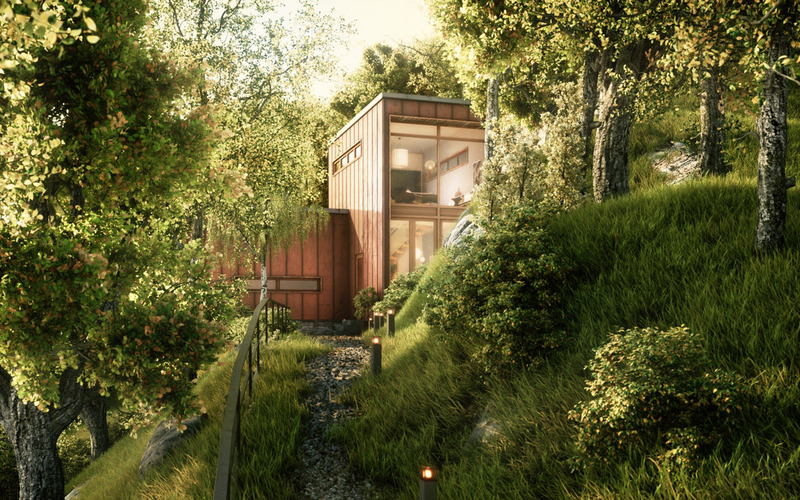 Nothing special to say from technical point of vue, as usual I mixed sunlight result with an hdr lit render and of course lot of instances to create all that nature environment. Everything was modeled in Blender, trees are generated with my own tree generator script. Edit : Not only 3DTotal granted me an award for this image (http://www.3dtotal.com/index_gallery_detailed2.php?id=5783&cat=scenes#.UzGn0PmSxBk) but they also asked me to write a making of, so if you are interested you may find it there: http://www.3dtotal.com/index_tutorial_detailed.php?id=1852#.UzGmyPmSxBk. just beatiful, flawless. Great job! One of the most fantastic environment i’ve ever seen. 5 stars. when can I move in? gorgeous. A little breakdown would be awesome. beautiful work man… like it a lot! Enrico, stop it. You’re frustrating me. When is this nose bleeding gonna stop? One more thing, I’m always amazed at your environments and how they incorporate with the architecture. Very well thought out almost as if you have been there 100’s of times. Absolutely awesomeness, can u share your tree generator and few screen grabs on how u reached this masterpiece. Well, considering you were not going for realism, I’d hate to think how good it would be if you did! Lovely work. No doubt, this is gallery bound. Just a friggen unbelievable masterpiece you have created here. I can always tend to appreciate just how much work you put in to model every detail throughout an entire environment so you can capture a dozen or so different images from it, I usually just model an environment to get one render. What’s amazing is that you decided to go all the way and model part of the inside of the house as well, just how much memory did it take to render these images? you made it perfect, as usual. It’s an honor to be able to comment on this. Loverly work! gets my stars for sure. 5 of them.